In the aftermath of my exhibit and presentations during the Beyond the Other Side of the Eye Exhibit in February in Minneapolis, one of the concepts that has been lingering with me that I haven’t had a chance to discuss at length yet is a theoretical set of additions to the traditional Lao dance repertoire: Lao American Speculative Dance. Dance of the imagination. One Lao community member I spoke with said we would run into friction because we have enough of a hard time getting Lao to learn traditional Lao dance, or Lao audiences to pay attention to the existing repertoire as it ‘fades’ into the sunset. But people have been saying that about ballet, ballroom, tango, and the cha-cha-cha for almost a century. If we treat formal Lao dance as something that cannot be expanded upon, then Lao dance has encountered a dead end, and over time the rot will spread across the beautiful face of Lao culture. Traditional Lao dance will not appeal to everyone, just as not all forms of music appeal to all people. After all, some hate rap and love death metal, others like zydeco over New Wave, others prefer pop to New Age. There’s tremendous variety and options. Viva la difference. As Lao, we have historically been able to embrace many different forms of the arts while still transmitting the core ideals of our culture. Over time, our culture and heritage will support some forms more than others, but we can do what we can to keep the most meaningful of these alive. I would not ask anyone to support all of the arts equally, but to at least find two or three forms in your life that you support with great passion, and respect the others. But there is also always room to evolve and innovate, or to expand upon the repertoire. Lao education must not be centered solely on rote memorization and repetition but curious encounter, contemplative appreciation, and bold innovation. We must not have water for blood, or we will not see the Golden Age of Lao thought emerge. If we don’t demonstrate to Lao youth and dancers of the possibilities within Lao arts, and give ourselves freedom to innovate properly, we’ll one day have generations that considers the tongue-in-cheek hip-hop song “Teach You How to Fawn” a serious addition to our dance and musical repertoire. A great hallmark of Lao arts has been the infusion of humor and a fluid, gentle grace to our work. When we wanted to express grand ideals and calls for peacefulness and the search for wisdom, even in the simplest, minimalist settings it was amazing. When the art called for bawdy energy or slapstick, you could have audiences rolling in the aisles without it being a South Park episode. I’d hate to see us get away from that. But we’ve seen Lao dance assaulted from two ends: joyless instructors who make it seem like traditional Lao dance must be presented with a thorny stick up its behind, or swaggering thugs full of hype and flair, but nothing meaningful at the core, masters of the Fon Douchebag. Lao American Speculative Dance could be one bold direction this innovation takes to revitalize our form for the next centuries ahead. It would encourage a new direction for Lao youth and the next generation of Lao choreographers. Lao American Speculative Dance is centered on the question: Where are our dances of the futuristic and the fantastic? Where are the dances that confront the present and our concerns, from UXO to overcoming the terrors of poverty, the traumas of PTSD, the struggles to adapt to new cultures while preserving our own heritage? I reject the idea these are unreasonable questions. One might turn to the dances of Ananya Dance Theater of Minnesota, a company of women artists, primarily of color, who work to create intersections of artistic excellence and social justice. Inspired by the commitment and passion that infuse women’s movements worldwide, these dancers create original dance theater that reflects women’s lives. One of the key outcomes is fostering strong communities, addressing social-justice issues, conveying power, and creating beauty. Centered in traditional South Asian dance forms often mixed with a sense of the mythic and imaginative, it obliges me to suggest Lao dance, too, can confront such issues, IF we took the kid gloves off. The UC Irvine Bare Bones Dance Theater presented this Filipino artist’s interpretation of the UXO issue in Laos, a 5-minute dance that sought, through a series of movements, to convey the horrors of the bombing, the attempt to resume life as farmers, but the consequences of lingering UXO. But I really don’t think that can or should be the last word in how we address this subject through an art form such as dance. I think this is a very intriguing dance, but the fact that we ourselves did not develop an artistic response to it first shows to me a critical blind spot emerging in our capacity for artistic expression. It is my hope that Binly Krisada, a dancer and poet in California, the Royal Lao Classical Dancers of Tennessee, and the Kinnaly Dance troupe in Washington will in particular take note and consider where we have opportunities to push the limits of the possible. 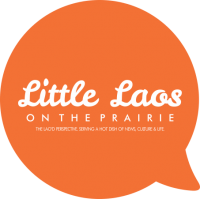 In Minnesota we have several sets of teachers who’ve worked on the traditional dances and youth who, through participation in the Lao Student Association at the University of Minnesota, have been dancing more actively in public to highlight our heritage and social concerns. But do we have the local infrastructure to let them take their dance to the next level? Who else might be in a position to explore this possibility, where they have a good balance of community support, vision, and resources to develop new work? When I initially suggested performances centered on the idea of Lao American Speculative Dance, I naturally received quite a few laughs, but so much is already in place. If a typical dance performance runs 60 to 90 minutes, the traditional dances that would be included in a Lao American Speculative Dance would include the Fon Ling, or Monkey Dance, although I think it should be classified as a Vanon Dance; the Fon Manola, a dance of the Kinnaly princess; the Fon Kinnaly; the Monkey and the Mermaid dance inspired by the epic Phra Lak Phra Lam; and the Fon Nyak, or the dance of the giant Rakshasas. If these alone were presented, it’s a half-hour show. What other dances might be developed to make a full evening of it? What might the Fon Nyakinee look like? Would it be a nod to the Nyakinee who vow to protect the teachings of the Buddha at the gathering at Vulture Peak? Or would it interpret the dark story of Phra Rod Meri, which told of a Nyakinee and her daughter who usurped a kingdom and turned the king’s wives into blind cannibals? Perhaps others would prefer an adaptation the epic romance of Phadaeng Nang Ai or the tale of the Toad King. Perhaps the Fon Gop could be the long-needed interpretative dance of our tradition of Gop Kin Deuane, the frog eating the moon. What might the Fon Bombies look like? Would it look like the dance at UC Irvine, or would it place it into the context of the 600 year history of Laos and the many other wars that have left so many Lao in diaspora? Between the troupes in Washington, California, the Midwest, Tennessee, and the East Coast, there are at least five groups who have been involved enough with the issue who could present fascinating responses. Would the Fon Phi Dip or Fon Phi Zom look like the Indian Thriller? Or take a more imaginative direction drawn from the far corners of Lao imagination? There are references to the Fon Nak, but it seems very rarely presented. The Fon Nakinee or Nakanya, would most likely be a nod to the 8-year old daughter of the Phya Nak who presented a pearl to the Buddha then demonstrated that even women can achieve enlightenment. The Fon Ya Wom might interpret the legend of the young orphan girls pursued by an elderly forest spirit who wants to eat them who chases them all of the way to the heavens. Because of the final outcome of this chase, such a dance might be hard to present, but an intriguing challenge. It might be easier to do the Fon Phi Kongkoi, but that might terrify too many audiences outright. What might the Fon Laomerica 3000 look like? How might it suggest a distant future? Would it look like Steam Powered Giraffe below? What might we see with the Fon Xieng Mieng? Might that be as fun as this dance for the African trickster folk hero of Anansi the Spider suggested by J’adore Dance? The Fon Sin Xay could also have many intriguing iterations, providing an interesting challenge for male dancers who want to examine the themes of brotherhood, honor, loyalty and love. A meaningful, earnest approach to exploring the many possibilities of the Lao imagination and contemporary social issues would have many side benefits beyond entertainment in our community. It would give many Lao vendors and traditional artisans economic opportunities. It would encourage more use of local arts spaces in the community, more research with our archives and among our wisdom-holders. Lao American Speculative Dance, or any well-managed Lao dance program, would provide our youth an alternative to gang involvement, and allow them to grow healthy bodies, healthy minds and spirits, and positive intergenerational and intercultural relationships. Involvement with an energized and innovating Lao dance program would give our students study skills and key communication skills that will help them in their professional, academic and civic lives. I hope in the future we will give this some serious consideration and give ourselves the freedom to hold on to our traditions and add our own voices, and feet, to this wondrous road and stage. I like the valuable info you supply for your articles. I’ll bookmark your weblog and take a look at again right here regularly. I’m fairly certain I’ll learn plenty of new stuff right right here! Best of luck for the next! hospitals, churches, restaurants, convenience stores, and fresh air systems).